We investigate shear strength properties of wet granular materials as a function of water content in the pendular state. Sand and glass beads were wetted and tested in a direct shear cell. In parallel, we carried out molecular dynamics simulations by using an explicit expression of capillary force as a function of interparticle distance, water bridge volume and surface tension. Experiments and numerical simulations are in good agreement. We show that the shear strength is mostly controlled by the distribution of liquid bonds. This property results leads to the saturation of shear strength as a function of water content. We arrive at the same conclusion by analyzing the shear strength from the microstructure and by accounting for particle polydispersity. 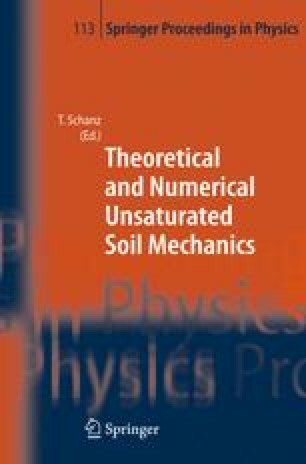 Finally, we discuss the potentialities of the discrete element approach as applied to unsaturated soils.